Vehicle sales in China declined 1.3 percent in the January-to-April period, the worst showing since 1998 when deliveries fell 1.6 percent. 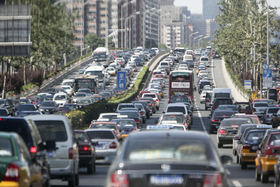 BEIJING (Bloomberg) -- China's cabinet agreed to revive financial incentives for consumers to trade in their passenger cars to help increase demand in the world's biggest vehicle market, a government official said. The cabinet approved the plan last week and relevant ministries are working on details, such as the types of vehicles covered and amount of state funding, according to the official, who asked not to be identified because the matter hasn't been made public. The government is also conducting feasibility studies on funding of new-car purchases in rural areas, the official said. Government officials are under mounting pressure to revive consumer demand after the economy grew slower than forecast and vehicle sales slumped. China in 2009 rolled out a cash-for-clunkers program to counter the global financial crisis, spurring 49.6 billion yuan ($7.8 billion) in new-car purchases the following year. Chinese total vehicle sales declined 1.3 percent in the January-to-April period to 6.42 million, the worst showing since 1998 when deliveries fell 1.6 percent, according to data compiled by the China Association of Automobile Manufacturers.